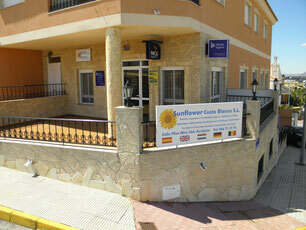 WELCOME TO THE WEBSITE OF SUNFLOWER COSTA BLANCA S.L. SUNFLOWER COSTA BLANCA STARTED IN JANUARY 2008, 9 YEARS LATER WE BECAME A WELL-KNOWN OFFICE IN OUR REGION DE VEGA BAJA. GROWTH IS STEADILY INCREASING AND THAT GIVES HOPE FOR THE FUTURE. ALSO ON THIS WEBSITE YOU WILL FIND HOMES THAT ARE PLACED ON OUR WEBSITE AT THE REQUEST OF OUR CUSTOMERS. WE MEDIATE BETWEEN BUYING AND SELLING. from Monday to Thursday from 9.30 to 15.30 uur. Friday from 9.30 to 14.00 uur.